The Canadian Seed Growers Association (CSGA) processes between 16,000 to 18,000 fields a year to certify crops of 2,000 different varieties and more than 50 different species. Inspecting these crops at the correct stage of maturity each summer has traditionally involved 200 inspectors from 40 different offices of the Canadian Food Inspection Agency over a three thousand mile territory. Recent budget cuts by the Government of Canada meant that CSGA had only 18 months to replace federal government inspectors with third-party inspectors from the private sector. To effectively manage this major change, the CSGA automated its 109-year-old postage- and paper-based process with Laserfiche. The CSGA office mailed pre-printed application forms to 3,500 seed growers throughout Canada, ranging from family farms to multi-national biotechnology companies. 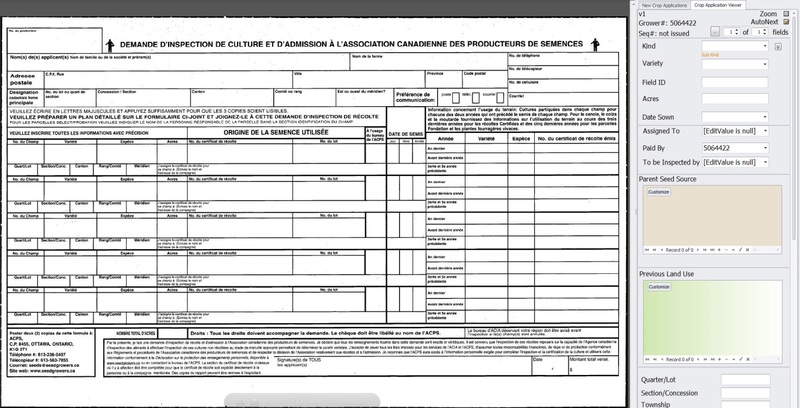 Seed growers completed these application forms and mailed them back to CSGA. CSGA appraisers then reviewed the crop inspection applications for incorrect or missing information. CSGA summer staff members then entered data from the paper application forms directly into a database and printed out three copies each of the personalized crop inspection report forms. These crop inspection reports were then mailed across Canada to 200 seed crop inspector supervisors. After their inspections, seed crop inspectors would complete the paper inspection report, give a copy to the grower and mail a copy back to the CSGA office. After sorting, the crop inspection reports were manually reviewed and appraised by CSGA appraisers for compliance with certification standards. This slow, postage- and paper-based process had negative impact on seed growers. On average, it would take 10 to 15 days for a completed inspection report to arrive at CSGA. With crops harvested soon after inspection, there was an ongoing risk that growers would not be aware of required corrective actions prior to harvest. This could prevent CSGA from certifying the seed crop and cost the grower thousands of dollars in the reduced value of the harvested non-certified seed. In 2013, CSGA transformed this outdated process with Laserfiche and a Laserfiche – LincDoc integration. 30% of all applications are now submitted online through an electronic form created in LincDoc. Once submitted online, the application form is automatically saved in the Laserfiche repository where it awaits review by a CSGA appraiser. With the help of the Laserfiche SDK, CSGA created an appraisal module to expedite application review. This module allows appraisers to make annotations and minor corrections, which then get passed directly into Laserfiche and the CSGA database. The remaining applications are still paper. Those are scanned upon receipt with Laserfiche Quick Fields and are processed through the same appraisal module described above. 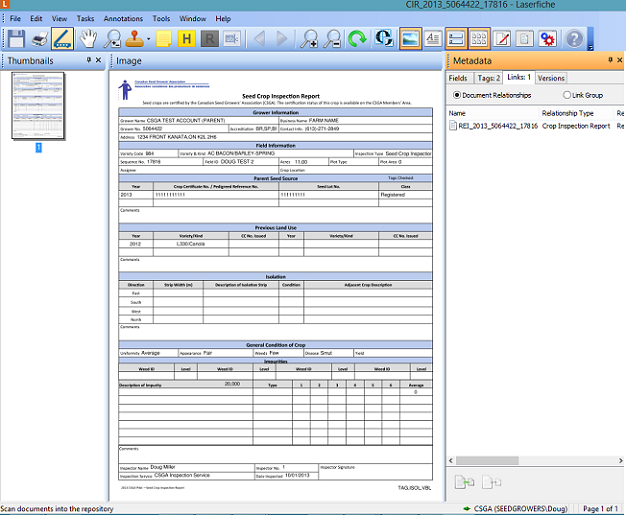 Once Laserfiche Quick Fields processes the applications, summer staff members use a module created with the Laserfiche SDK—a rapid data entry screen—to do data entry. This module uses zoom fields like in Laserfiche Quick Fields. Once the applications have been submitted and reviewed by appraisers for incorrect and missing information, Laserfiche Workflow kicks in. 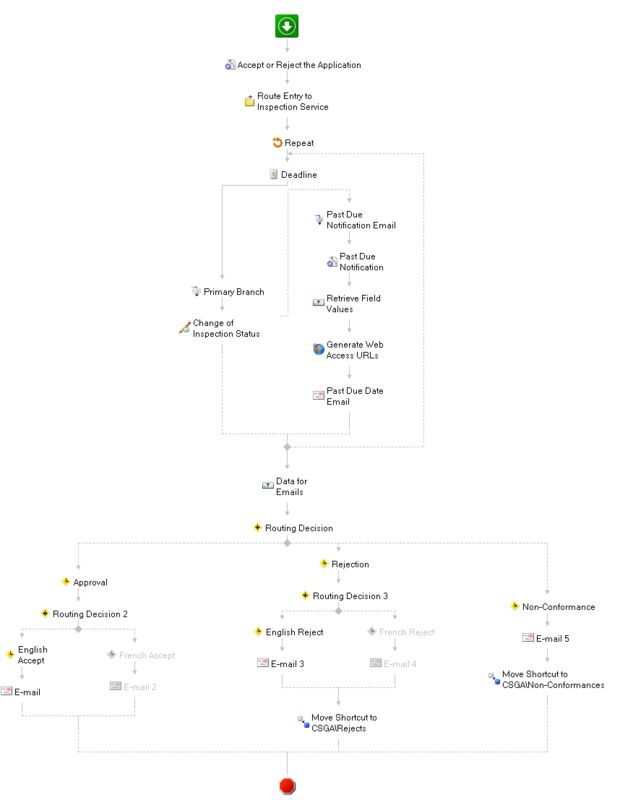 This workflow is actually a Laserfiche Workflow business process that contains an “Accept or Reject the Application” Business Process Step activity. This activity has a due date of two days, after which the status is changed from “On-time” to “Past-due.” There are also instructions provided for seed crop inspectors on how to accept or reject the applications. 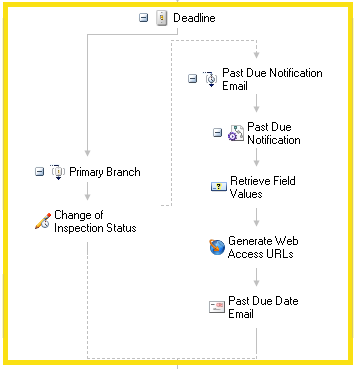 A Deadline activity is used to enforce the due date specified in the Business Process Step. If applications are not reviewed within two days, an email is sent to inspectors notifying them that the application must be reviewed immediately. Instructions are also changed to reflect the urgency of the request. 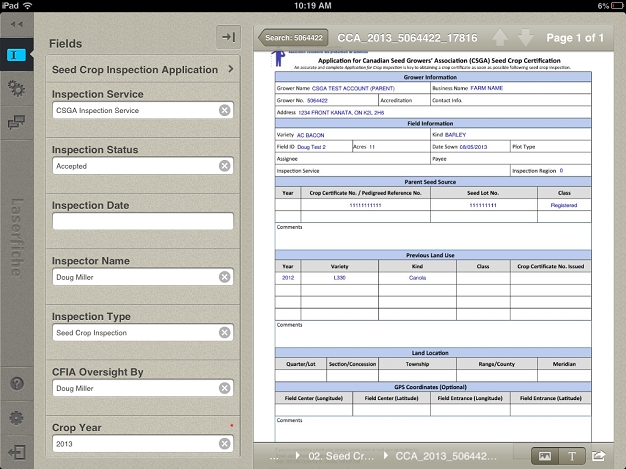 Seed crop inspectors use Laserfiche Mobile for iPad or Laserfiche Web Access to view the applications. The lead inspectors/coordinators can open applications and accept or reject them by changing the value of the “Inspection Status” field. They must also designate a specific inspector and select the inspection date. Once applications are accepted, growers are notified by email. If an application is rejected, the grower is also notified and the application is moved to a “Rejects” folder. If, for some reason, an application is neither accepted nor rejected, it moves through a third branch of the workflow called “Non-Conformance.” If an application passes through this branch, I get notified by email and, as Operations Manager, can address the issue. If applications are accepted, inspectors perform the seed crop inspections. As part of the inspections, inspectors verify isolation distances, previous land use history and parent seed genetic identity tags. They also count difficult-to-separate weeds and other crop kinds, genetic off-types and other varieties that are observed in representative counts throughout the seed field. 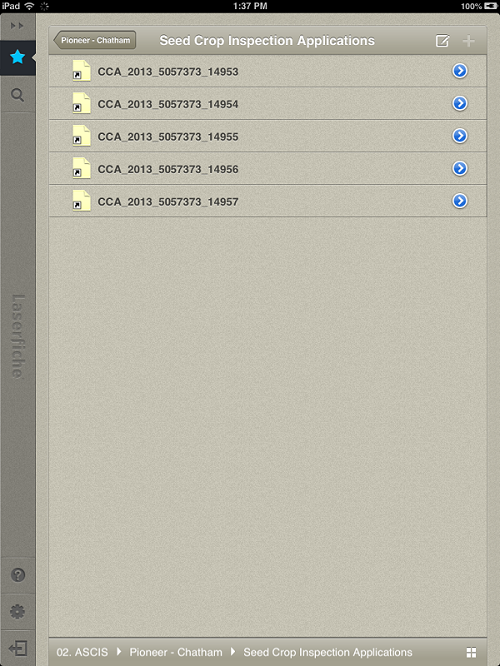 Once inspections are finished, inspectors complete the inspection reports on their iPads, using LincDoc Mobile. 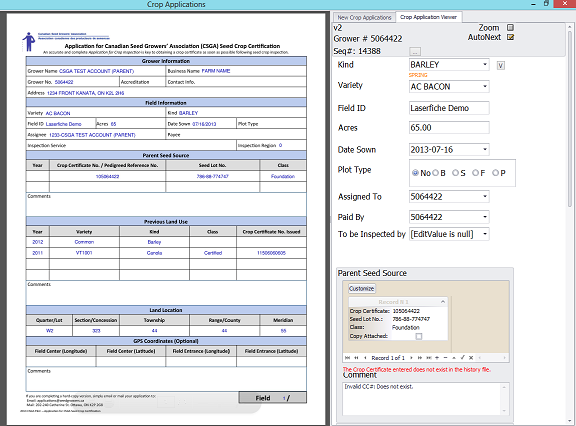 This crop inspection report form is then submitted directly into Laserfiche, triggering another Laserfiche Workflow business process. This business process is very similar to the one described above except that it routes crop inspection reports for review and appraisal to the CSGA employee who is qualified to appraise that specific kind or pedigreed status of crop. Seed growers are issued a pedigreed seed crop certificate or are notified immediately if their field requires corrective actions to meet CSGA certification standards. 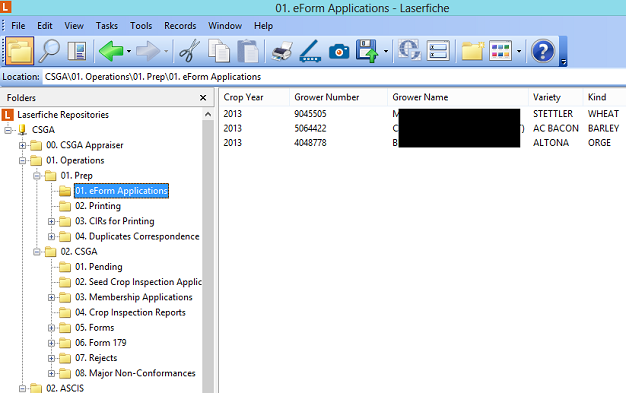 As part of this process, inspection reports are linked to the initial application in Laserfiche. 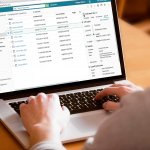 All of the archived files have retention applied to them automatically with Laserfiche Records Management Edition. 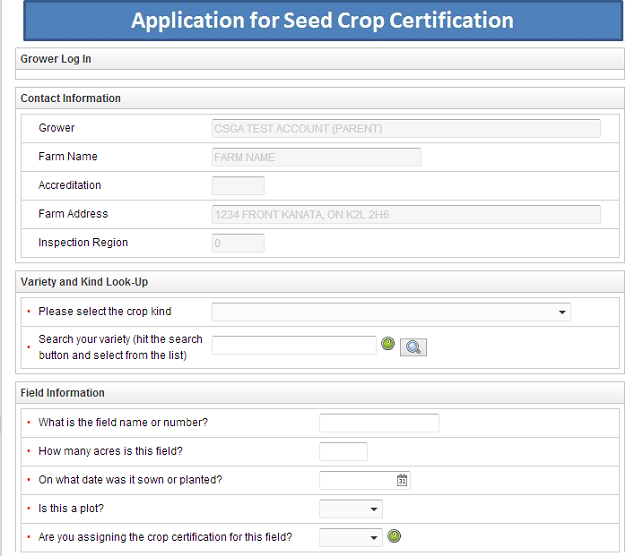 Seed crop certification applications are now processed up to ten times faster. Postage costs have been reduced. 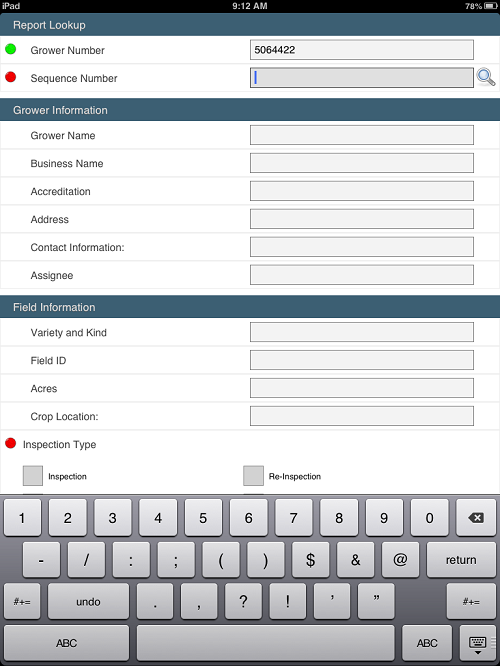 All seed growers, variety distributors and developers have instant, online access to the required current inspection and certification status information through the Laserfiche Client, Laserfiche Web Access or Laserfiche Mobile. This allows them to obtain the information exactly when they need it. With the present Laserfiche process, lag time between inspection report submission by inspectors and grower notification of inspection results has been reduced from 10 to 15 days to just two. Business processes at CSGA have not only been automated, but streamlined and optimized as well. Just because paper flowed in one way, doesn’t mean that the electronic data must flow in the same way. 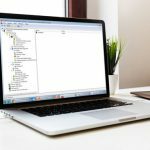 When we need to change any steps in the present process, the underlying workflow can be changed in just ten minutes.